Fairy Tail Chapter 285 is the next chapter in the exciting series of Fairy Tail manga chapter. Erza wins and defeated all 100 monsters! Unbelievable but its true! Fairy Tail 285 spoiler is not yet available. It might be released 24 hours before chapter 285 is released. UPDATE: I know it is a very late update. But Fairy Tale 285 was release last Saturday. It is entitled MPF. You can read Fairy Tale 285 on popular manga sites. The previous chapter was an epic chapter and another victory. 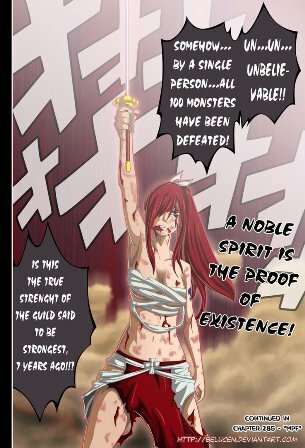 Though badly beaten up and only a couple of bandage left to wrap her body, Erza still fought to the very last enemy. It’s like a scarlet flower bloomed. A champion has risen from the depths of hellish monsters. Can’t wait for Erza vs Kagura to happen. Fairy Tail 285 will be released by Friday night or Saturday morning. So stay tuned and find out what happens next. If you love Fairy Tail, please support Fairy Tail manga buy buying its official and original volumes once it is available in your region.